Anonymity is something that seems next to impossible in this era of government surveillance. Even Tor and VPNs are no longer seem to be enough to protect user privacy. Once your IP address is discovered, your Game Over! 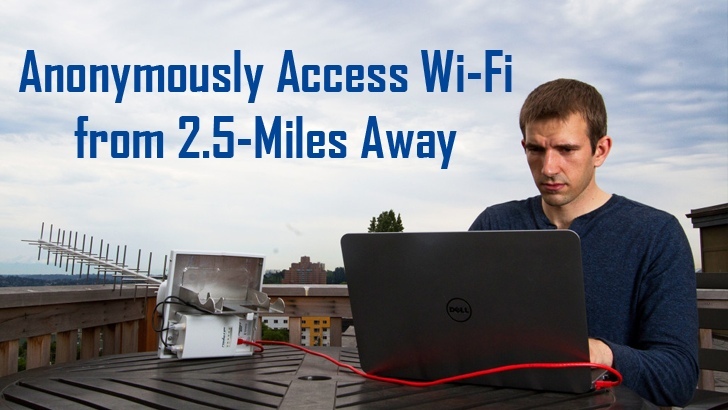 However, a method have been devised that not only allow users to anonymously connect to public Wi-Fi network, but also let them connect from about 2.5 Miles away. Security researcher Benjamin Caudill has developed a device that adds an extra layer of anonymity to whistleblowers, journalists, dissidents and, of course, criminals. Dubbed ProxyHam, it's a "hardware proxy" that allows users to connect to a long-distance public Wi-Fi network over an unidentifiable low-frequency radio channels, making it more difficult for government agencies and spies to unearth the real identity and source of the Internet traffic. Proxyham is comprised of a WiFi-enabled Raspberry Pi computer, along with a three antennas setup. One antenna is used to connect to a source Wi-Fi network at a public place, and the other two antennas are used to transmit the Wi-Fi signal at a 900 MHz frequency. By relying on a 900 MegaHertz radio connection, ProxyHam effectively connects to a far-away Wi-Fi, with a range of between 1 and 2.5 Miles, depending upon certain interference factors. Therefore, in case if spies manage to completely trace the target's internet connection, they will find only the IP address of ProxyHam box transmitting a low-level radio signal thousands of feet away in some direction. Caudill tells Motherboard that he and his colleagues are also working to add additional features like self-destruction to the ProxyHam. Future iterations might be small enough as to fit Proxyham into a book to make it easier to hide. "If you throw this in a library it would take you years to be able to identify it," Caudill said. Caudill will unveil this game changer ProxyHam box at the Def Con hacker conference in Las Vegas next month. He will also release the hardware specs, the source code and the blueprint of the device so that anyone can develop their own. Caudill is planning to sell ProxyHam at cost for $200, "as a service to the community," and he also hopes that he’ll be able to drop the price to $150 soon.